What was scheduled as a three-day tournament, turned into a four-day long event. The field of 1,956 was dwindled down to just two after Day 3, with Emile Schiff and Chris Klodnicki returning for a heads-up duel on an impromptu fourth day of play. After 61 hands of the mano-a-mano fight, Chris Klodnicki came out on top. Klodnicki, with $9,009,141 in live tournament earnings before the tournament began but no WSOP bracelets, doubled up in a big hand with ace-king against ace-ten and never surrendered the chip lead he gained there. 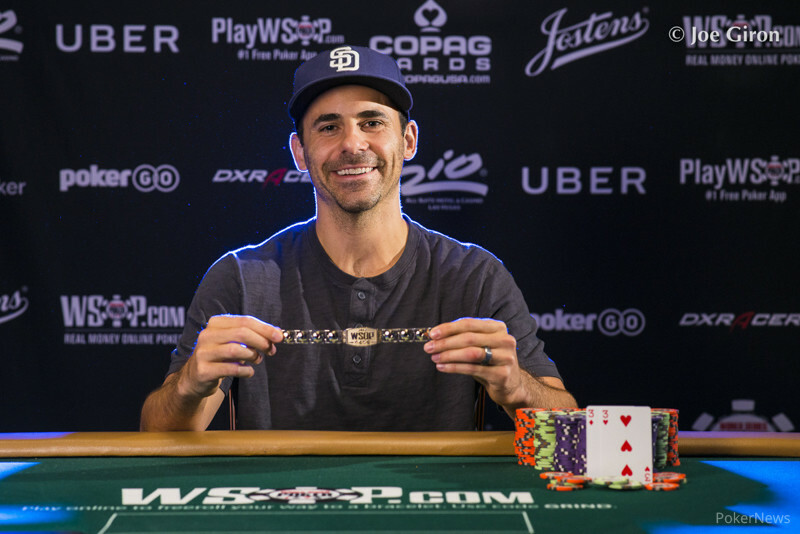 Klodnicki had a WSOP Circuit ring already and finished runner-up in two of the biggest events at the WSOP (second in the $50,000 Poker Players Championship in 2012 and second in $111,111 One Drop in 2013), but now he finally may call himself a WSOP bracelet winner. He's $428,423 richer for it. "It definitely feels more like a relief," Klodnicki said after winning. On Day 3 of this event, which was planned as being the last day, 23 players returned from Day 2. The field quickly dwindled down to just 18 players. It took some time for the chip leaders to emerge from the pack, but when they did it was a furious battle. 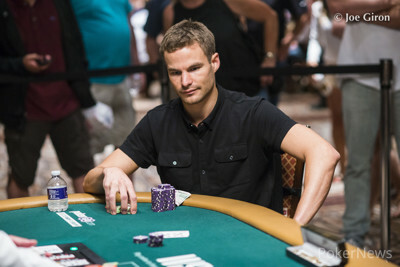 By the time the final tabled was reached, Klodnicki had a comfortable chip lead that he would not look back on for some time. Dylan Hortin (ninth place - $34,083) was taken out by Klodnicki after his pocket nines were beaten on the river. After the dinner break, Aditya Sushant (eighth place - $44,255) was next to hit the rail after running his ace-king into the pocket aces of Schiff. Kenny Hallaert (seventh place - $58,083) put up a good fight on the final table, but just fell short. He was all in preflop against Schiff, but would end up losing to a straight. 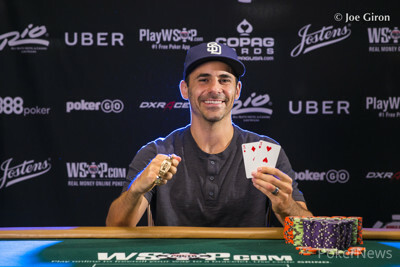 Six-handed play lasted a couple levels until Darren Elias (sixth place - $77,047) got into a race scenario with jacks against Schuyler Thornton's ace-queen. Thornton made a flush and eliminated Elias. Ulrich Schnetter (fifth place - $103,281) stayed quiet for most of the night but eventually ran his ace-king into the pocket aces of Schiff again. Schnetter was unable to catch up and was sent to the rail. Ben Zamani (fourth place - $139,896) fell victim to the Klodnicki comeback when he lost most of his chips with ten-eight suited against ace-four off. He was unable to connect with the board and was left with just one small blind. He was eliminated in the next hand. Then there was Thornton (third place - $191,453) who ran into the bulldozer of Schiff. He got all of his chips in the middle with ace-queen but Schiff rolled over kings. Thornton could not hit an ace and that led to the heads-up match between Schiff and Klodnicki. After playing for a bit, they were presented with the option to play an extra level, or call it a day and return the next day. Klodnicki wanted the break: "I was kinda tired, my stamina is not what it used to be. I felt a little tired and I thought it would be better just going home and starting fresh." They returned at noon with Schiff in the lead. Klodnicki, however, thought he had an edge. "Obviously, when the stakes are high, anything can happen. But I had a feel for his strategy, I started figuring it out a little bit. I developed my strategy based on it, and the cards worked in my favor." Klodnicki won with ace-king to Schiff's ace-ten to double up and he stayed on top from there on out. With Schiff short, the shoving started. For some time, the all-ins went uncalled, but eventually, Klodnicki called with pocket threes. Shiff had nine-seven off and didn't improve. "You gotta win these all-ins," Klodnicki said afterward, "No matter how good you play. "I've been kind of having a bad summer," Klodnicki said. "I was making Day 2s lately, and I ended up winning this, which was shocking!" Klodnicki commented on his summer as a whole which improved massively toward the end with this win. The latest WSOP bracelet winner won't jump straight into the Main Event; he plans to take some rest first. "I've done well in the Main Event and I'm sure I'll play fine. Hopefully [I can make] another deep run," Klodnicki said. Hand #260: Emile Schiff moved all in for 2,740,000 and Chris Klodnicki peeled his cards from the sides for a sweat. He turned over the and then the and quickly announced, "Call." Schiff was at risk with in a coin flip against Klodnicki's pocket threes. The flop came and Schiff picked up a gutshot straight draw to go with his two overcards. The turn was the and the river was the and Schiff had to settle for second place for a payout worth $264,692. Hand #252: Emile Schiff folded, giving Chris Klodnicki a walk. Hand #253: Klodnicki open shoved. Schiff folded. Hand #254: Schiff open shoved. Klodnicki folded. Hand #255: Klodnicki opened for 400,000 and Schiff folded. Hand #256: Schiff folded. Klodnicki got a walk. Hand #257: Klodnicki opened for 400,000, but folded to Schiff's shove. Hand #258: Schiff open-shoved for 2,735,000 and Klodnicki folded. Hand #259: Klodnicki opened for 400,000 and Schiff folded. Hands #245-251: More Shoves. More Folds. Hand #245: Chris Klodnicki moved all in and Emile Schiff folded. Hand #246: Klodnicki got a walk. Hand #247: Klodnicki moved all in and Schiff mucked. Hand #248: Schiff moved all in and Klodnicki folded. Hand #249: Klodnicki moved all in and Schiff folded. Hand #250: Schiff moved all in and Klodnicki folded. Hand #251: Klodnicki raised to 400,000, Schiff moved all in, and Klodnicki folded. Hand #240: Emile Schiff shoved and Chris Klodnicki folded. Hand #241: Klodnicki opened for 400,000 and Schiff folded. Hand #242: Schiff shoved and Klodnicki folded. Hand #243: Klodnicki shoved and Schiff folded. Hand #244: Schiff shoved and Klodnicki folded. The two players are on a short break with Chris Klodnicki holding a huge lead with 12,165,000 to Emile Schiff's 2,535,00. Hand #235: Chris Klodnicki opened the button for 325,000 and Emile Schiff folded. Hand #236: Schiff limped in and Klodnicki checked. Both checked the flop of as well and Klodnicki took down the pot with a 225,000 bet on the turn. Hand #237: Klodnicki opened for 325,000 and Schiff folded. Hand #238: Schiff open-shoved and Klodnicki folded. Hand #239: Klodnicki opened for 325,000 and Schiff called. Both checked the flop of before Schiff check-folded to a bet of 350,000 on the turn. Hand #230: Chris Klodnicki got a walk. Hand #231: Klodnicki raised to 325,000 and Schiff called. The flop came and both players checked. The turn was the , Schiff bet 450,000, and Klodnicki called. The river was the . Schiff checked and Klodnicki bet 1,000,000. Schiff mucked. Hand #232: Schiff raised to 325,000 and Klodnicki called. The flop came and both players checked to the on the turn. Both players checked to the on the river. Klodnicki checked, Schiff bet 300,000, and Klodnicki folded. Hand #233: Klodnicki raised to 325,000 and Schiff called. the flop came and Schiff check-called a bet of 325,000 from Klodnicki. The turn was the and both players checked. The river was the . Schiff bet 425,000 and Klodnicki tank-called. Schiff mucked his cards and Klodnicki didn't have to show. Hand #234: Schiff raised to 325,000, Klodnicki three-bet to 900,000 and Schiff folded.